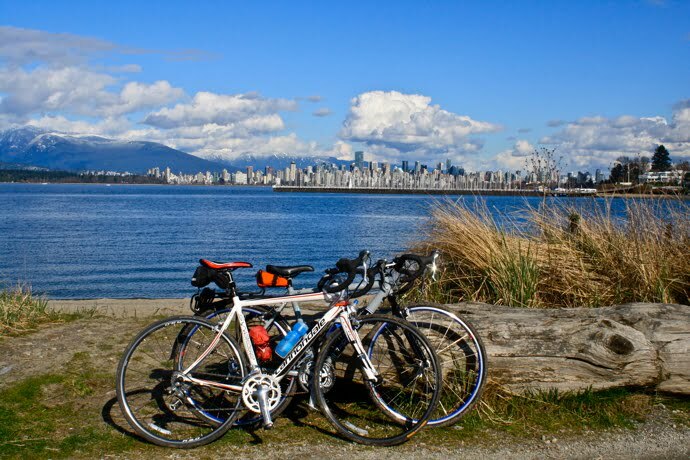 VANCOUVER, BRITISH COLUMBIA — Whether you are an avid cyclist, a fairweather biker or a novice pedal pusher, ’tis the season to pump up the tires and go for a spin around Vancouver. Trails and bike routes criss-cross the entire city making virtually every part of town easily accessible on two wheels, whether you’re taking a tour around the seawall, spending a day at the beach or checking out the cherry blossoms in full bloom. According to Arno Shortinghuis of the Vancouver Area Cycling Coalition, Vancouver is one of the top cities in North America for cyclists. “I would say we’re on the leading edge, certainly in Canada,” he says. He credits much of cycling’s growing popularity to the extensive system of designated bike routes and a variety of programs that increase biker safety and promote non-motorized forms of transportation. “We have a growing team of volunteers and paid instructors working hard to spread the word that cycling is a healthy and enjoyable way to see the city,” says Shortinghuis. 1. Cycle along SW Marine Drive, past the University of British Columbia campus and down toward Spanish Banks to Jericho Beach. This is a stunning ride on a clear day, offering views all the way to Vancouver Island if you’re lucky. When all’s said and done, congratulate yourself for an afternoon well spent and grab a signature Caesar at the Local or take a dip in the pool in the Kitsilano neighbourhood. You deserve it. 2. Head south out of town toward Steveston and cycle along the West Dyke Trail. It’s mostly flat and always peaceful, winding past marshlands along the Sturgeon Banks coastline. The trail itself is only six kilometres and is well-maintained, but not paved. Those looking for a longer ride will find lots of side roads and beautiful areas in Richmond and Steveston, while those with families or who are short on time will appreciate the simplicity of this little gem. 3. Ride the seawall to Lighthouse Park in West Vancouver. This is a day trip with plenty of opportunities to stop for lunch or grab a coffee en route. The paved trail and secondary roads take you around Stanley Park, over the Lions Gate Bridge and along the North Shore to the aquatic junction of the Burrard Inlet and Howe Sound. The point itself was actually charted by Captain George Vancouver and was, in fact, one of Canada’s first manned lighthouses. No wheels? No worries. Spokes Bicycle Rentals at the corner of Denman and West Georgia Streets has everything you need to hit the dusty trail for a bike trip. It carries a wide variety of styles and models including hybrids and tandem bikes, as well as attachments and accessories for transporting wee ones, all within a stone’s throw from the city’s beloved Stanley Park and the seawall that circles Vancouver. So there are no excuses. Whether it’s Earth Day or not, visitors and residents alike should be happily taking spins around Vancouver, a city that really is a playground for pedallers. Photo of the Week: Congratulations, Joash Krishna!